This is a short book (~50 pages). And one that is packed with all the advice you’ll need to find a job in the private sector. The focus may be industry, but I think the strategies in this book apply to finding a job in nearly any career field beyond the academy. My commentary on the book itself will be in standard font. How this all makes me feel about my own job search and how I take this feed back will be in italics. It is more than a little ironic that scientists dedicated to expanding knowledge and exploring possibilities are so myopic and limited. I know I have not been good about exploring possibilities for myself while I was occupied studying nature even though doing it full time seems unlikely to pan out. Of course the research is important, but it’s really important to look at yourself and your own direction too. The actual advice here is the standard faire you’ll find in most career advice coming from someone who’s worked in industry for awhile and knows what industry hiring managers look for in people transitioning from academia. It’s not rocket science, just not easy, either (like everything, it’s real work). Start early. Details matter. Show and don’t tell. Nelson walks readers through the steps of a job search with the goal of just landing that first job in industry after academia. The shift isn’t an easy one to make. It requires a shift in perspective, a re-formatting of documents, and of course the biggest thing: building a network before you actually need a job. Nelson has tips for how to go about it and use LinkedIN in particular to help your networking. The big thing is that it’s not really about self-promotion, but genuinely connecting with people and seeking out information. And it definitely do information interviews. How to find people? Attend networking events. What’s a networking event? That’s a little unclear to me from the book, but anywhere where people are gathering from a given industry of interest I imagine. My understanding of networking is to genuinely connect with people and ask a subset of them to connect you with other people. It’s best in person and this gives people that live in cities where networking events are a regular occurrence a decided advantage. I live in a small town and it’s hard to find such things, so I’m relegated to online networking (better than nothing and I really do love Twitter). I also find the idea of an information interview foreign still, though apparently this is standard practice. That networking is about not self-promotion makes me a lot more comfortable with it. It’s putting your voice and skill out into the world and genuinely connecting with people. The next step in the book is to apply for jobs, utilizing the network you have to help you. The idea of sending your resume and cover letter to your contact as well as through traditional channels is a good one. And even before that the advice about formatting a resume is really sound. Customizing it for each job you apply to is important. Asking for help isn’t something that is natural to me. And I don’t know if it’s a particularly general trait of academics, but might be. I always feel like it’s interrupting and for some reason that’s the big faux pa. Customizing resumes is important, but I am still baffled as to how to reconcile this with LinkedIN, a static (though updatable) career profile. And a hiring manager will almost certainly check your LinkedIN profile too. I suppose they get different things out of each, but it still seems like a quirk of being able to connect in so many ways these days. Wandering Scientist Ends with tips for once you have an interview. Your great resume can’t do much for you at this point. It’s all about how well the interaction goes, how you answer questions, and even navigate the illegal, but seemingly often asked questions of hiring managers that Nelson goes through one by one. This book is straightforward— the way it’s written resonated with me even if I am starting this process late. There’s no sugar coating. And the tips for dealing with a lot of various career scenarios for someone are presented like having to deal with gaps in a resume or acknowledging that you don’t have a particular skill but are a quick study and shouldn’t be discounted. Nelson also notes that for a first job in industry, you will likely be starting from the bottom, especially if you’re switching fields. Basically, don’t have a huge ego as a Ph.D. You might well rise quickly through the ranks. Focus on doing good work. It also doesn’t presume, as much career advice can, that every applicant is a superstar that is polished and amazing from the get go. Nelson acknowledges the human side all of us have. And that to me is refreshing. It also makes clear that people in industry are people too. Something that is easy for an academic to forget, strangely enough. I am still a bit panicked about my own job search and networking. And just all of it. It’s all so up-in-the-air-uncertain. And as I always have, worry about fitting in or just where my skills would be useful (and what skills I can pick up). This book does give me strategies to try. No job search is easy, but having this concise guide is quite helpful. 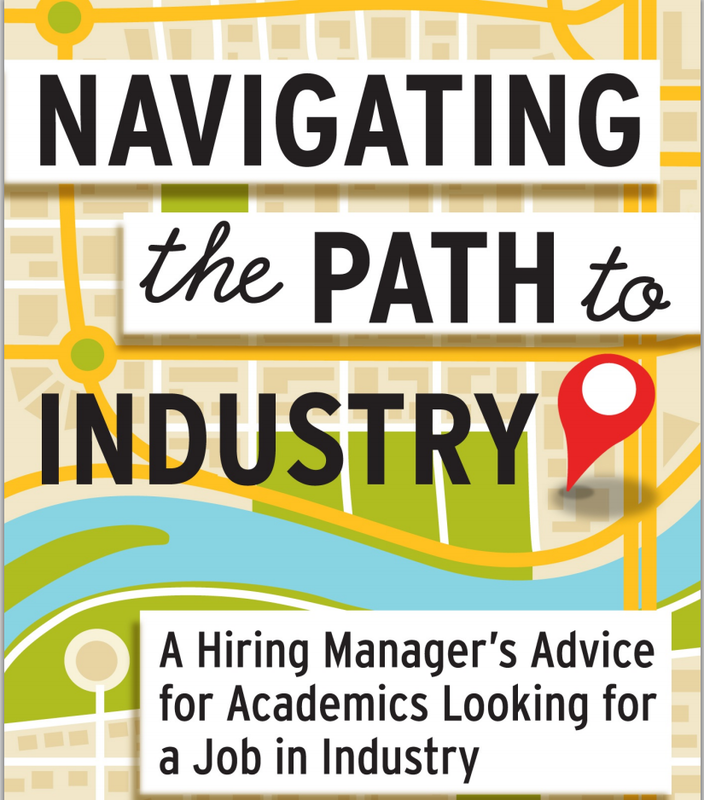 Navigating the Path to Industry is available from Amazon in both Kindle and Paperback formats. What depression takes from you. As depression recedes into my rear view window, I’ve been reflecting more on just what exactly it took away from my life. Obviously, I was a lot less vital as Andrew Solomon so eloquently put it. And there’s the not enjoying life, feeling lethargic all the time and being otherwise frozen in place unable to muster much motivation (you want to do things even things you don’t feel like doing…but just can’t) or energy for much of anything not to mention the black suicide thoughts. But there’s one aspect of it that I’d like to write specifically about and that’s the impact on learning and getting experiencing things. I’m not just talking academics either (after all some very successful, smart people also deal with depression who got good grades). My sense is that depression was severely impairing for me with respect to learning new things or feeling like anything I tried represented progress or moving forward. The things I have learned still seem hazy in my brain some how. It prevented connection. I did a brief Google search for studies on depression and how it affects learning and didn’t come up with much other than the obvious– depression is a factor in people leaving school all together, but for those who stay, they aren’t any less likely to graduate, go onto college, work all of the normal things people do in life; except they’re hiding their depression a lot of times. It takes a lot of effort to appear normal; depression is isolating and what I often told myself was “I’m keeping this hidden because no one else should have to deal with or see this, it’s just too dark”. So to be able to get up and out the door despite the forceful depressive voice saying “you’re not worth the space you take up” really does take a lot of mental strength. It doesn’t take much to go from functioning to lying on the (often metaphorical) floor. The brain alone uses 25% of the energy we consume and if a good portion of that is taken over by depression, other functions suffer. Because learning well requires an engaged and vital mind, depression is a huge impairment of that process. The only possible upside is that depressives apparently see the world more accurately than non-depressives who are overly optimistic in their estimates of things. Even though I’m not a depression researcher, I’ll relate what my feeling is for what I’ve lost in terms of learning which of course as someone who believes that learning and education are keys to advancement makes me feel terrible at how much potential I’ve lost over years of being depressed. Before getting into this more, I’ll just say if you or someone you know is showing signs of depression, get help or ask them to help. No one is alone with depression. I repeat, you are not alone. For me, learning is one of those unaddressed businesses to fill my soul. So here’s how depression affected my learning. For many years and even still now, I felt less than anyone else; everyone else’s advancement was more important than my own, after all, they’re worthy of existence. I wasn’t. Some of this isn’t necessarily depression related; it has to do with people pleasing, perfectionism and the fixed mindset that can certainly contribute to depression, especially if you don’t want to learn. Taking calculated risks was for other people to do, not someone like me. Feelings? Those were for other people too. Mine had to be kept inside. Related to feeling less than is the feeling that I didn’t deserve anything, including knowledge or expanding skills. I have done some of that, but it wasn’t as if I felt I deserved any of it. The great resources available to me to learn new things weren’t for me. They were for the aforementioned people who did & who’d use them to do great things. I didn’t spend money or invest in myself, really. While saving money is good, never spending a dime is not the road to growth, financial independence or a great career. This included simple things like using Evernote or Gmail or anything else. If you don’t get, use and learn the tools of your profession, that’s a very real loss for an individual. It’s not that I did none of it, but it was certainly at what felt like a glacial pace and that’s a problem, especially in today’s world. Depression creates a fog over the mind. There’s a flattening of emotions. An emotional connection to a moment of learning helps it stick and concretize in the mind. And even when something is learned or progress is made, in my depressed mind state, it never felt like progress was being made; I hadn’t really learned anything, even if I had at some level. It’s not that there’s no learning, but it doesn’t seem like progress happens and making decisions about what to do with what you learn or even what to learn (having a hard time making decisions is part of being depressed). There’s a fog over everything, a haze that won’t alleviate and it makes deeply experiencing things hard. The ideal for any creative is to get into a flow state when we’re working on a new idea or just working; independent of motivation to work (don’t wait to be motivated; dive in, even if it’s uninspiring…that’s hard to do but with practice it does happen), the creative mind just gets into a state of flow where time just doesn’t register and you’re “in the zone” just writing, creating, doing. With the depressed brain, the flow state happens rarely. Depression’s narrative is that things will never change. That runs counter to the creative narrative that sees what is and posits what could be. It’s making connections between things that aren’t always obvious. Finding connection doesn’t come as easily with a depressive mindset. Even finding those ideas to connect is harder with the depressed mind. There’s a lot more discussion about mental health and STEM fields and I think that’s a good thing. I hope this post contributes to that by addressing exactly why it’s a problem to have a depressed scientist or other creative (anyone who is depressed is obviously a problem). Wherever the depression comes from; genetics, circumstance, the academic system that appears to cultivate anxiety and depression, it’s a drag not only on the scientific enterprise as a whole, but particularly tragic for the individuals who suffer and don’t maximize their potential. Author Ian StreetPosted on April 20, 2014 April 20, 2014 Categories 2014, book review, brain state, career, depression, disconnection, Ian 3.0, impostor syndrome, learning, Learning deeply, my brain, perfectionism, postdoc experience, science, science culture, teaching, trial and error, Uncategorized, vulnerabilityTags Academia, depression, science, Science Careers1 Comment on What depression takes from you. I recently finished reading “What the Best College Students Do” and it fits in with what I’ve been writing about in my blog. I’ve had a few weeks since I finished it to think about it, so I thought I’d share my thoughts about how it might apply it to my own life as well as how this might impact my teaching practices and how I think about them. I am writing this from memory, so any content I talk about is what I am recalling (best way to review a book, almost certainly not). The book is definitely not about how to get good grades. Ken Bain focuses a lot more on what he calls ‘deep learning’. It is basically learning from a vulnerable and authentic place, a theme I’ve run across again and again in my readings this last year. This is contrasted with those he calls ‘surface learners’, who just learn what they need to get the grade or pass the exam. In other words, getting good grades to please someone else, not themselves. Sounds very familiar. The profiles of ‘deep learners’ in the book include a lot of very prominent people, including Stephen Colbert and Neil deGrasse Tyson (two of my favorite people), but also other people who are not as well know but who he considers to be deep learners. What they all have in common is a curiousity about the world and a particular perspective and passion they found to follow through with. I found myself wishing I had that kind of clarity when I was younger. Sadly, I, like many others, were fixated on doing well in school as an end. Of course, that’s not really the point of getting an education. The book starts off with a course taught at a college in Texas called ‘integration of abilities’ that sounds like it would have been torture for me to go through. The whole idea was to get in touch with the rhythms of your own mind, perceive the world in multiple ways, break things down and build them up again. Basically getting in touch with what matters to you, linking your interests in disparate things together. From there, you go off and learn what you need to do to succeed. In the book, he highlights research about having a ‘growth mindset’ as opposed to a ‘fixed mindset’ (the former is far superior I’m learning in my own life now). Bain also goes through studies of how the brain best learns, what is a good use of our time (reading, writing, e.g.) and having self-compassion (basically accepting things that happen, not ripping yourself apart, and moving on). In sum, I would say the best college students take a Bayesian approach. They incorporate new data, new knowledge into their current model of the world. All these people also seem to take chances and be very self-assured. They also try, fail, try again and learn from their errors. They embrace failure as a way to learn. Almost the opposite of perfectionists. As for how this will affect how I teach, or create the learning environment for students, I think it is a challenge to create a deep learning environment. But there are some things I will incorporate such as giving students chances for ungraded trial and error before a graded task is assigned. Also, having students keep a journal of their class appears beneficial as well. However, I think there are limits to what individual teachers can do; there do need to be cultural and institutional shifts that focus less on tests and more on truly measuring learning (the two aren’t necessarily the same thing). In my personal life, this is the message I’ve been trying to incorporate into my mind for the last year. Be vulnerable. Embrace failure. Try and try again. Do new things as much as possible. Ask whether you learned something new each day. Take chances. Bomb and realize that it’s not that bad; it is survivable. I still feel like I’m trying to find what I truly care deeply about, or at least need to get out from under the large amount of shame I carry around with me most days which really does drive my disconnection from the world (I’m reading up on this more- reading Brene Brown’s book ‘Daring Greatly’). I really want to come in from the cold and am slowly wending my way back into connecting and possibly learning deeply. Author Ian StreetPosted on November 19, 2012 Categories book review, brain state, Learning deeply, teaching, trial and error, vulnerability1 Comment on Learning deeply.